Published: Dec. 16, 2015 at 02:33 p.m. 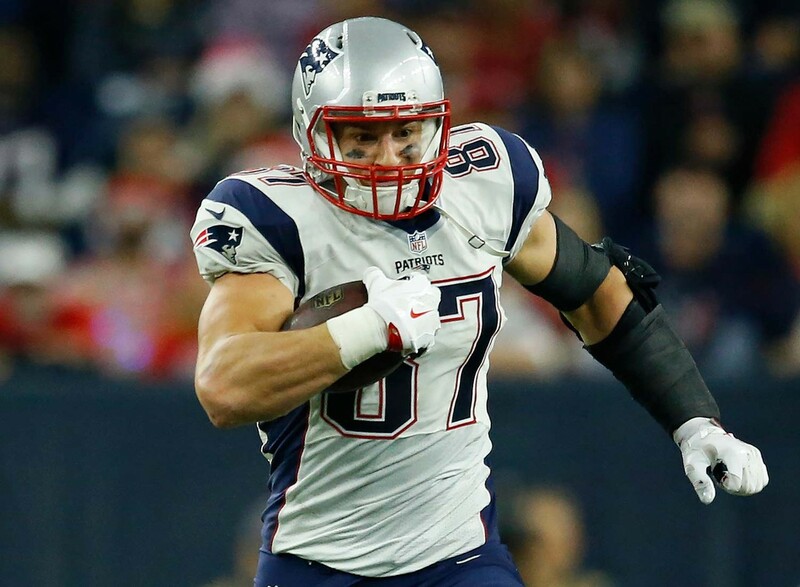 When Gronk plays, he's the consensus No. 1 tight end, and usually ends up atop this list as a result. Peterson battled through a tough matchup last week to post solid totals. This week he faces a division rival (Chicago) with a banged up front seven. It's no surprise he's our highest ranked running back. Scoring 17 touchdowns in four games without a single turnover is a surefire way to get to the top of our weekly QB rankings. Playing Cleveland also doesn't hurt. After swimming around in Lake Norman last week, Jones travels to warmer waters this week when he faces the Jaguars suspect secondary. Fantasy owners who survived last week should be rewarded in Week 15. Newton has dabbed his way into our hearts and the top of the QB ranks. Scoring 20-plus fantasy points in five of the last six games certainly helped, too. If Olsen plays this week (and it sounds like he will), he's a solid bet to finish as one of the top scoring tight ends. As is the case every week. Palmer leads the best passing attack in the NFL against one of the worst pass defenses in the NFL this week. What more do you need to know? Hopkins has disappointed in two of his last three games, but he should be set to explode against the Indianapolis secondary. Barnidge has scored nine-plus fantasy points in nine of his 11 games since his Week 3 breakout performance. That's consistency fantasy owners can count on. He also gets a nice matchup this week, as Seattle has struggled to cover tight ends all season long. Brady has lost plenty of offensive weapons this season, but it doesn't matter. He could have someone with actual skillets for hands as a wide receiver and Brady would still hit him for three touchdowns. It all came together for Reed last week, as he caught all nine of his targets for 120 yards and a touchdown. While we don't expect a repeat, he should be able to deliver a solid stat line against the Bills. Martin could have had a monster game last week, but the Bucs shifted to a pass-heavy game script when they fell behind, limiting his opportunities (just 28 snaps). He should bounce back in a tough game against the Rams this week on Thursday night football. Robinson certainly disappointed last week, but his touchdown reception save plenty of fantasy owners. The Falcons look like a tough matchup on paper, but their team is in free fall right now. Plus, Robinson has roasted better cornerbacks than Desmond Trufant. Gurley reminded the world just how special he is last week. He was able to overcome the Rams terrible offense and Detroit's stout run defense single-handedly. Start him the rest of the way and don't think twice. Marshall has been a revelation this year for the Jets. Among wide receivers, he's second in touchdown receptions and fifth in receiving yards. He should go to work against the Cowboys secondary. If Eifert clears the league's concussion protocol this week, he'll be one of the top tight ends in fantasy. If not, his owners will need to stream the position. Mike McCarthy reclaiming playcalling duties is a good thing for Rodgers. We don't anticipate the team being so run-heavy again this, though the improved balance will set Rodgers up for more big plays off of play-action. He's still a QB1, though with a slightly lower ceiling than some expected. Freeman's production has been suffering as a result of the poor play of Matt Ryan, but in a plus matchup with the Jaguars that could turn into a shootout, he should be able to post a solid stat line. Johnson was a few inches away from a monster game last week, though his owners certainly didn't complain with 12.3 points. He has a dream matchup this week against an Eagles defense that has lost some of it's early-season luster, especially against the run. Green has been on a tear with 18-plus fantasy points in three straight weeks. His ceiling certainly lowers with Andy Dalton out with an injury, but as Matt Harmon noted in the Opportunity Report this week, AJ McCarron could still funnel targets to Green as a safety valve in his first career start. Bortles is third in the league in touchdown passes with 30, trailing only Tom Brady and Carson Palmer. Raise your hand if you predicted that ... that's what we thought. Anyway, Bortles and the Jags offense should have no problem going to work against the Falcons this weekend. All I want for Christmas is for Lamar Miller to get the ball. When he does, good things happen. Jeffery is still a target monster for the Bears offense, and that doesn't figure to change this week against Minnesota. He should see the volume necessary to post solid totals in a tougher matchup. Williams would be a lot higher on this list if he weren't facing the stout Denver defense. He's been great this year and fantasy owners shouldn't even consider benching him. Brown vs. Chris Harris and Aqib Talib will be one of the matchups to watch this weekend. We still like Brown's odds of winning enough of those battles to deliver for his fantasy owners.